The business end of a mobile particle accelerator. Okay, there are no such things as ghosts. However, there are weapons that you might use to fight them; chief among these is the Proton Pack, a kind of particle-beam weapon, developed for the famous Ghostbusters. "Why worry? Each of us is walking around with an unlicensed nuclear accelerator strapped to his back." From Ghostbusters, by Harold Ramis. Just don't cross the streams (the particle beams). That would be "bad." 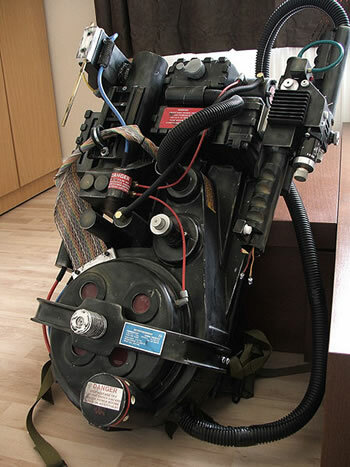 Proton packs were created by the prop department of Columbia Pictures. They are made of molded fiberglass shells on aluminium backplates (or "motherboards") bolted to military surplus A.L.I.C.E. frames. The basic shape was sculpted from foam and then a rubber mould was made of it, from which fibreglass shells were pulled. The "wand" had an extending barrel mechanism and the electronics were quite advanced for the time. They were then finished with various surplus 1960's resistors, pneumatic fittings, hoses and ribbon cable, as well as surplus warning labels and custom made metal fittings. The overall wieght of these props is said to be around 35lbs. Particle-beam weapons are devices that accelerate subatomic particles or atoms to velocities near the speed of light, focused into a narrow stream. The energy of the weapon is the aggregate kinetic energy of the individual particles forming the beam. A lightning bolt, a flow of electrons, is similar to a particle beam. For those still keeping up with these weapons, there are two general types, classified by their use: charged particle-beam weapons (endoatmospheric use) and neutral particle-beam weapons (exoatmospheric use). See Introducing the Particle-Beam Weapon for more information.